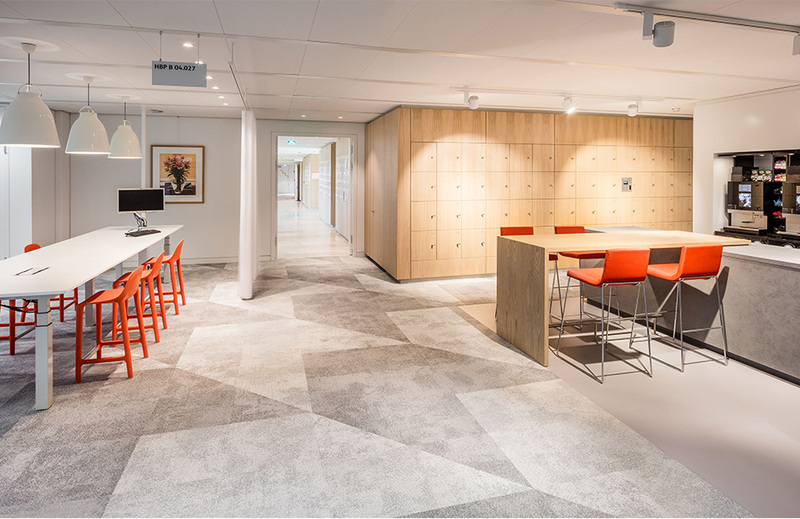 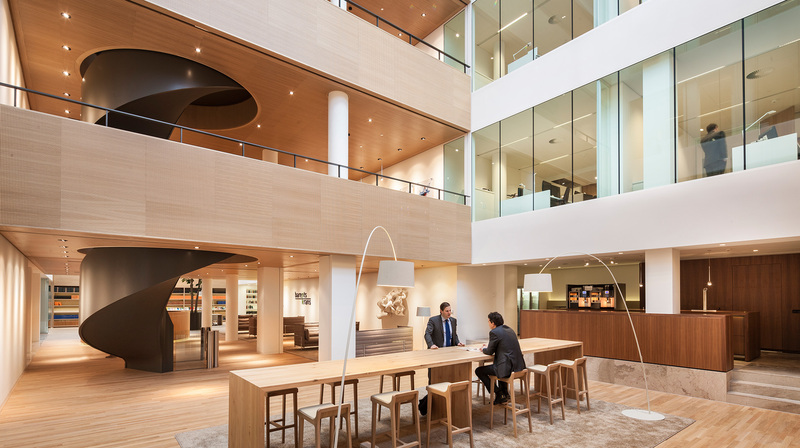 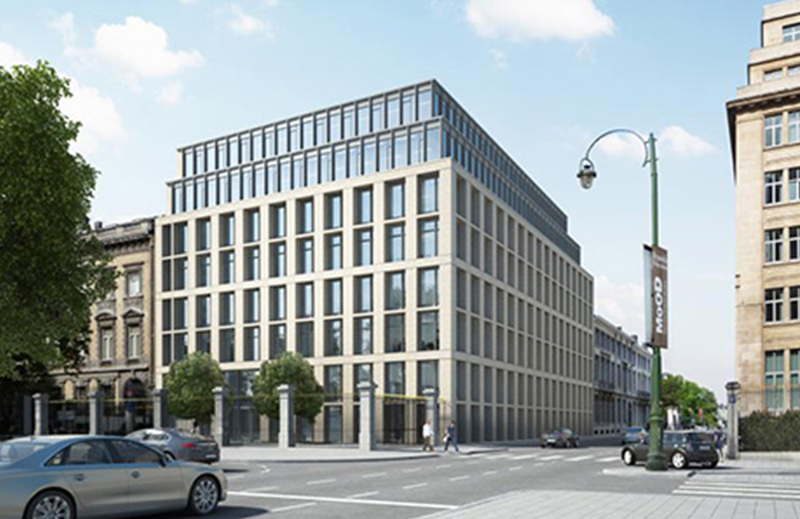 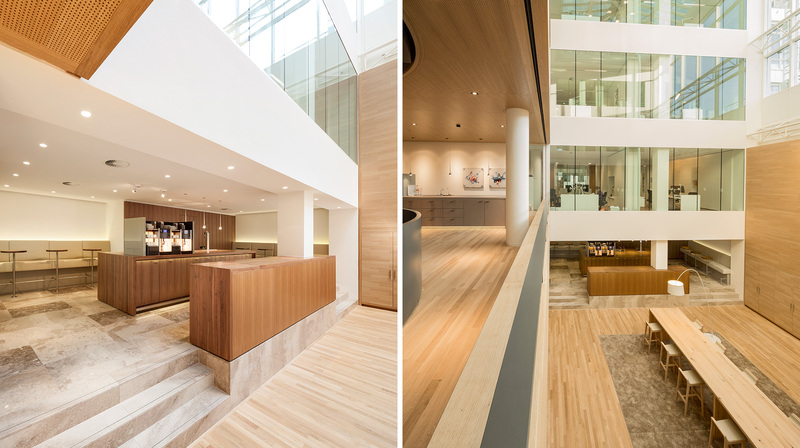 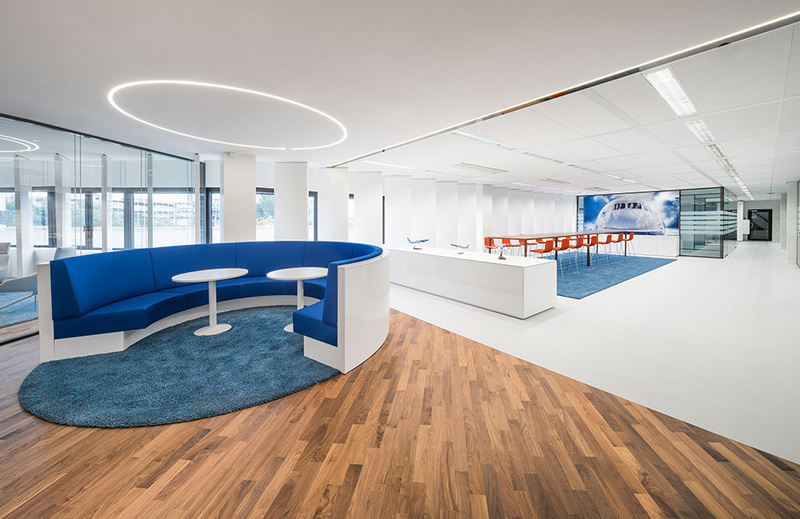 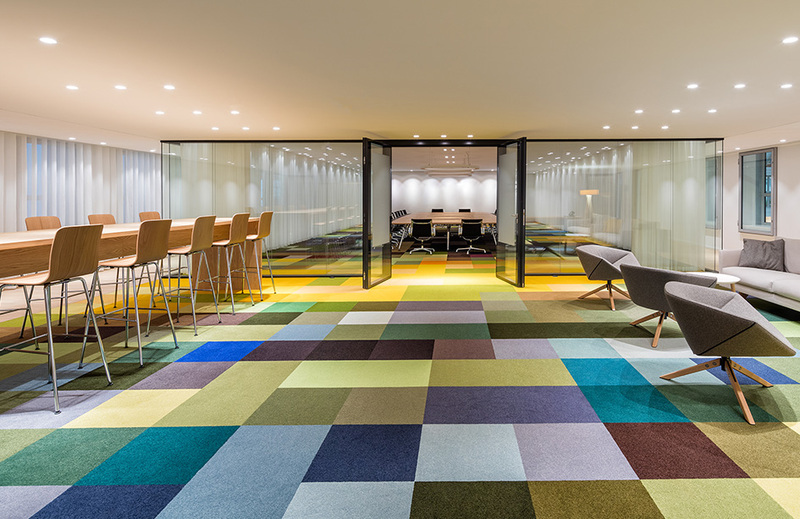 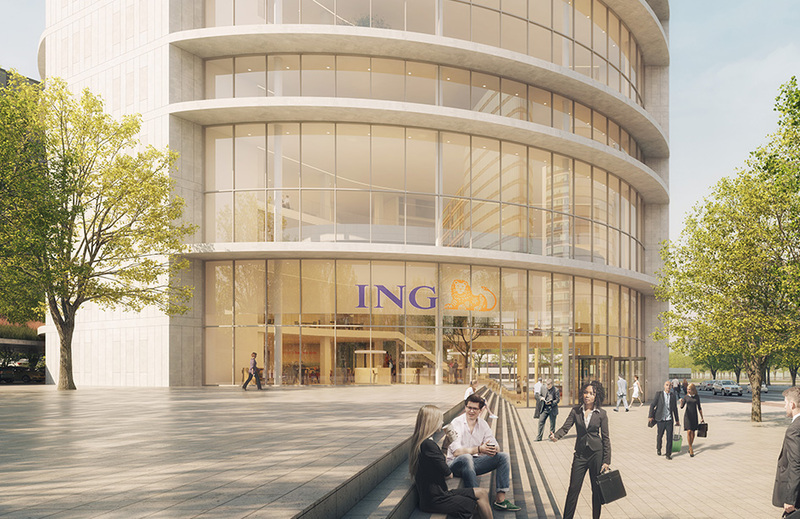 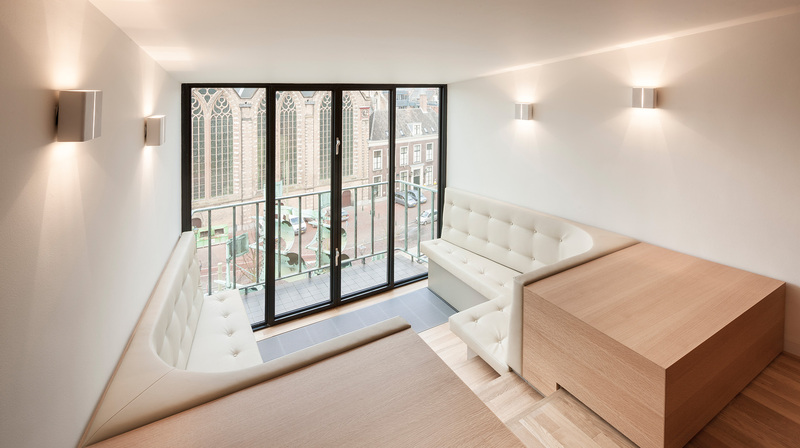 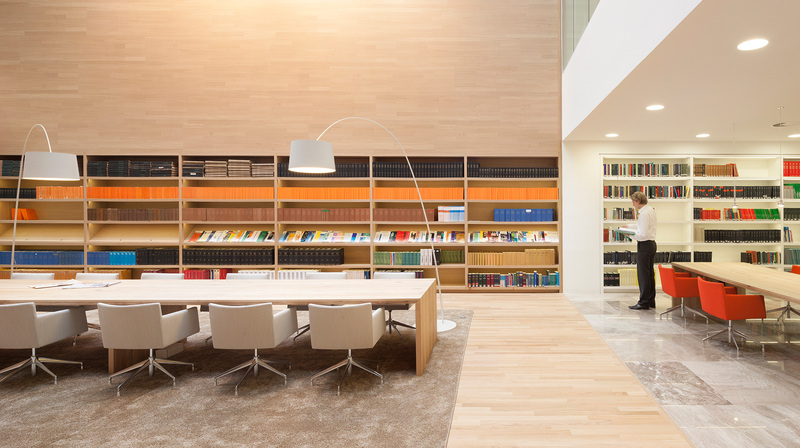 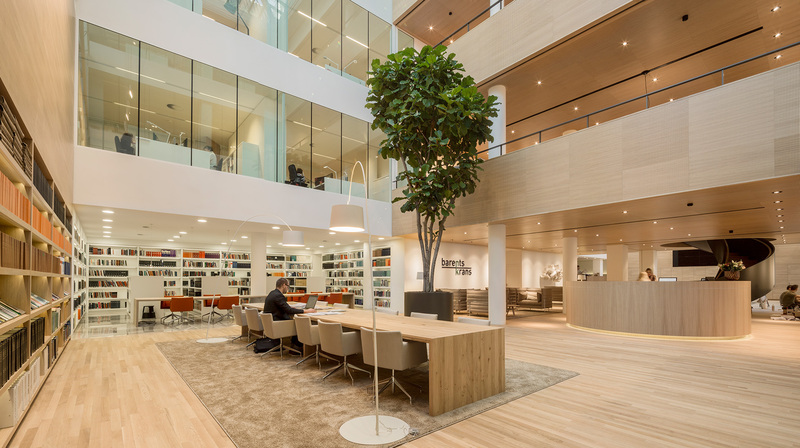 A successful collaboration between the renowned law and notary firm BarentsKrants, CBRE and HofmanDujardin has resulted in a remarkable building renovation in The Hague. 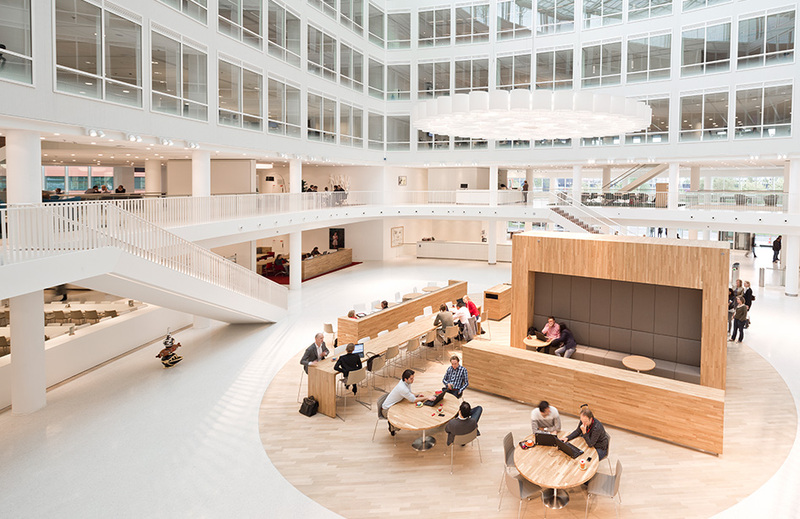 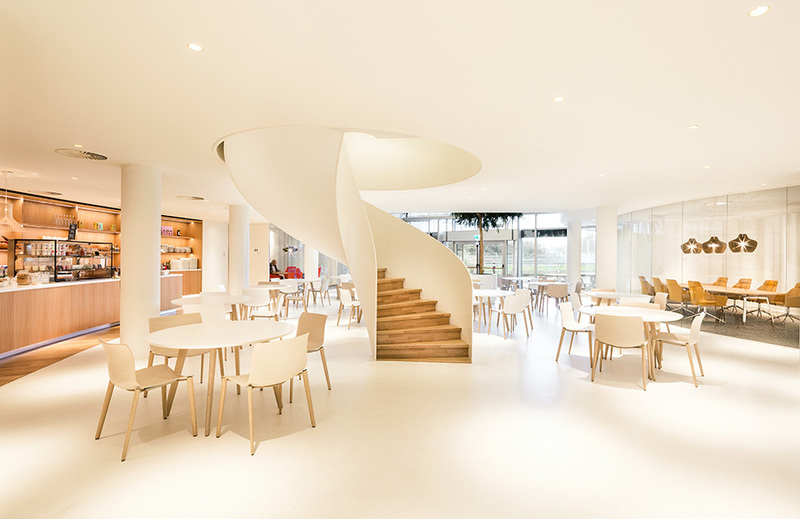 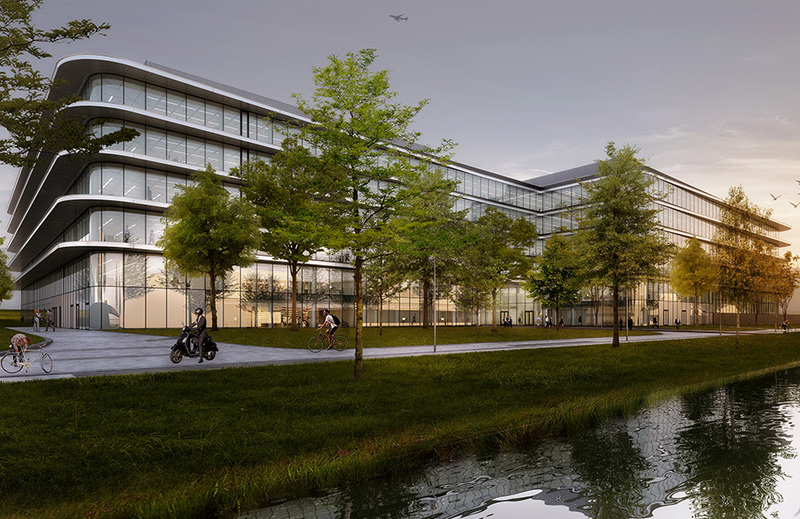 Before BarentsKrans moved into their new location, near the Dutch Parliament building in the city center, they commissioned HofmanDujardin to revolutionize the building. 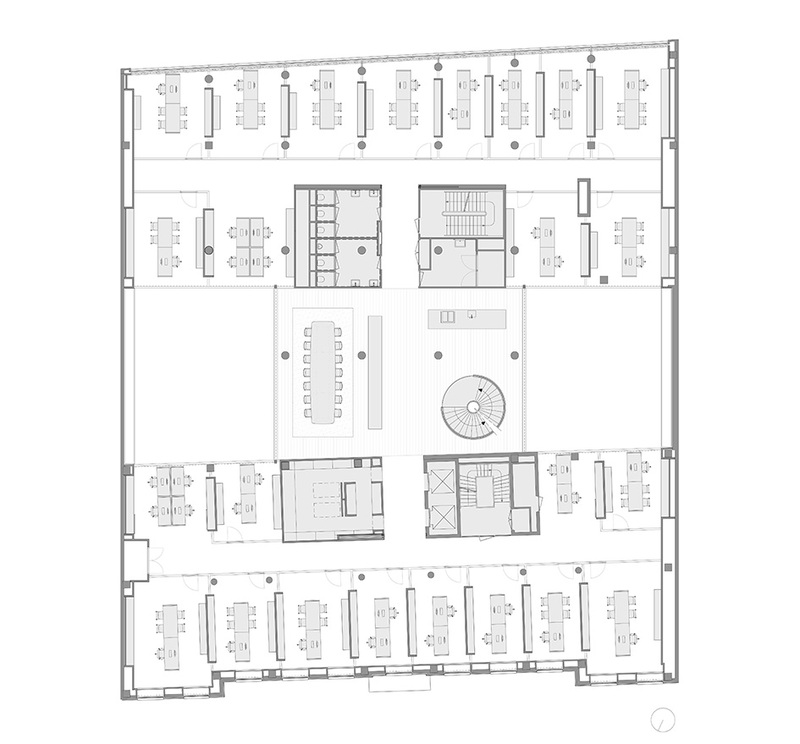 The building was constructed in 1950 and commands floor space of 7000m². 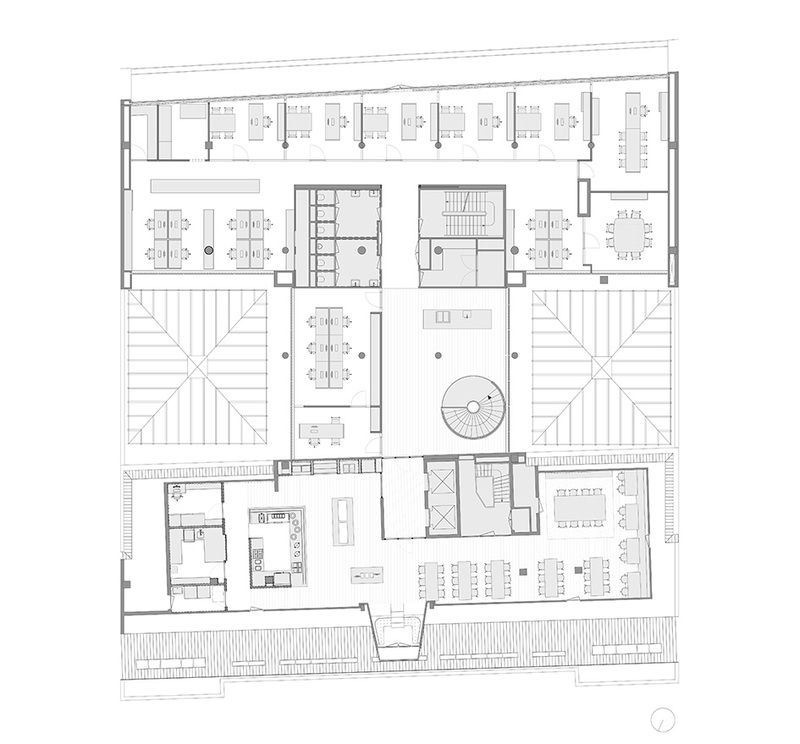 It was originally divided into a front building, with a majestic marble facade facing the main street, and building at the rear of the site, with two spacious atrium’s separating them. 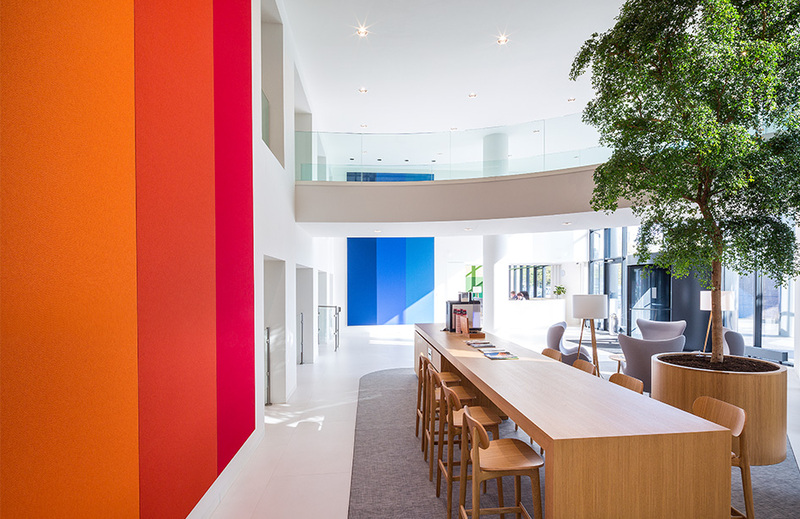 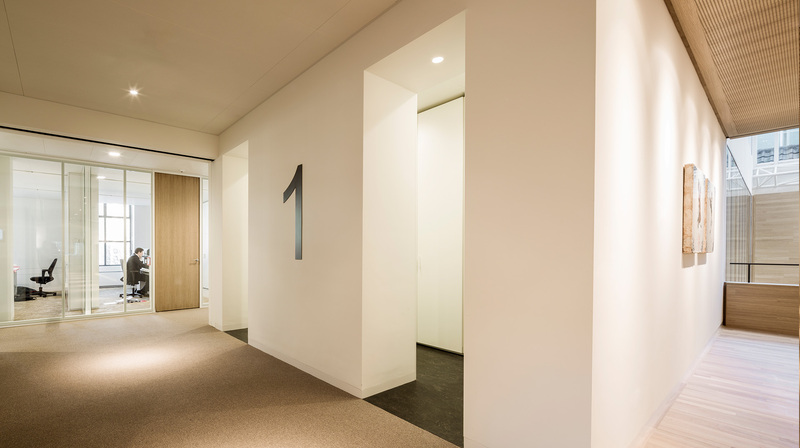 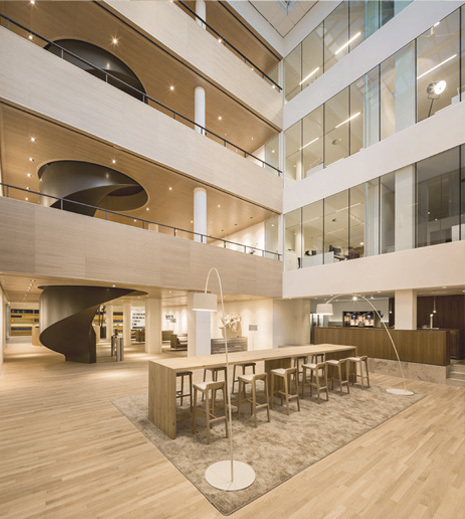 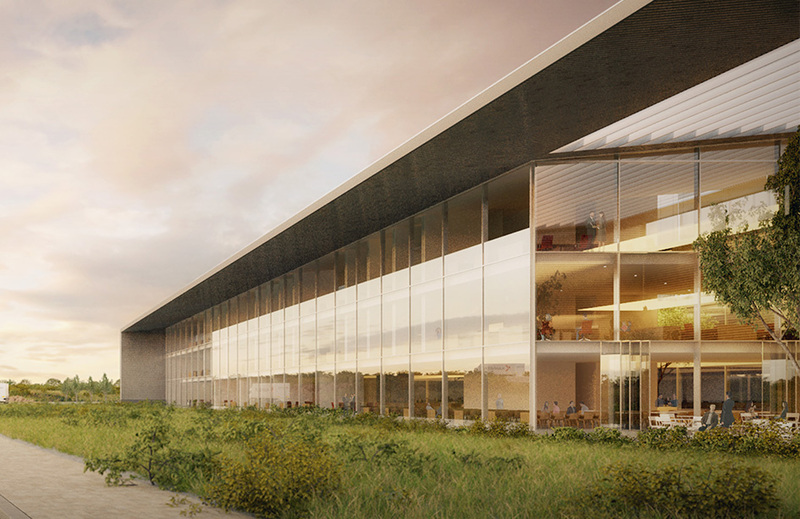 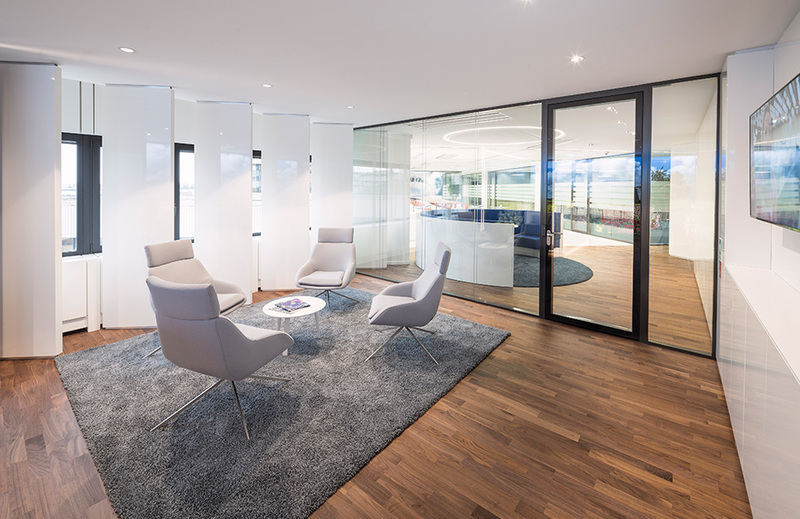 By the time the teams of partners, lawyers and other employees moved in to the headquarters, HofmanDujardin had breathed new life into the building and created a modern, sleek and sophisticated space. 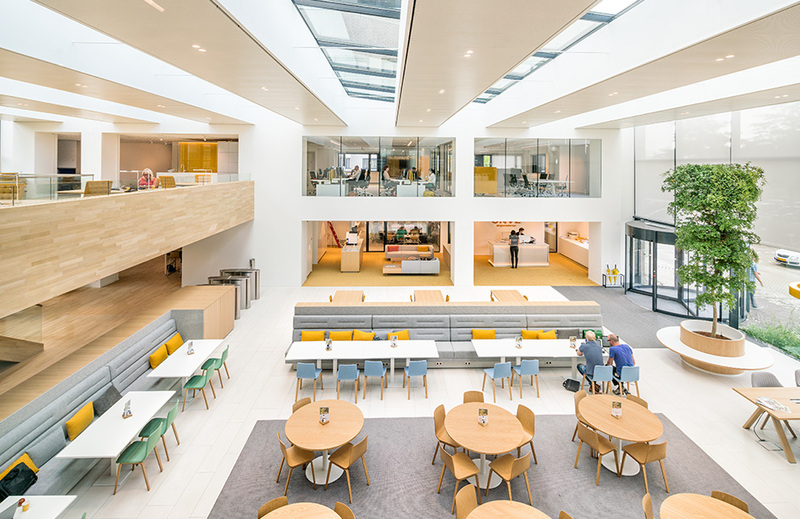 The design team opened up and linked the atrium’s, creating a larger, more open and transparent central area in the heart of the building, flooded with natural light. 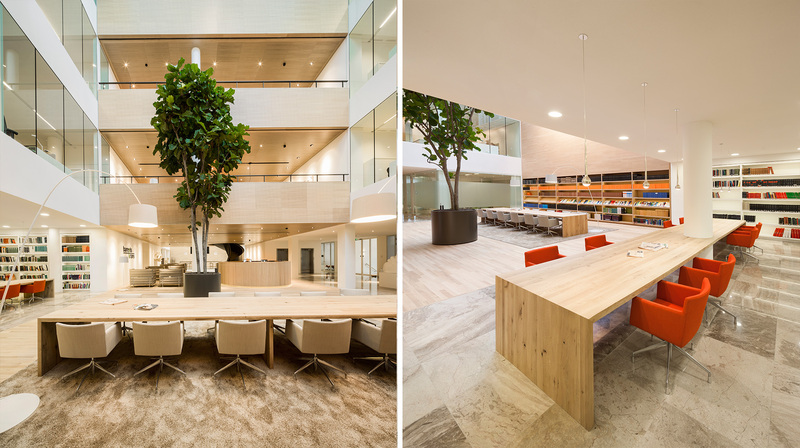 The use of materials and the positioning of furniture and internal structures create three distinct spaces within this one central area. 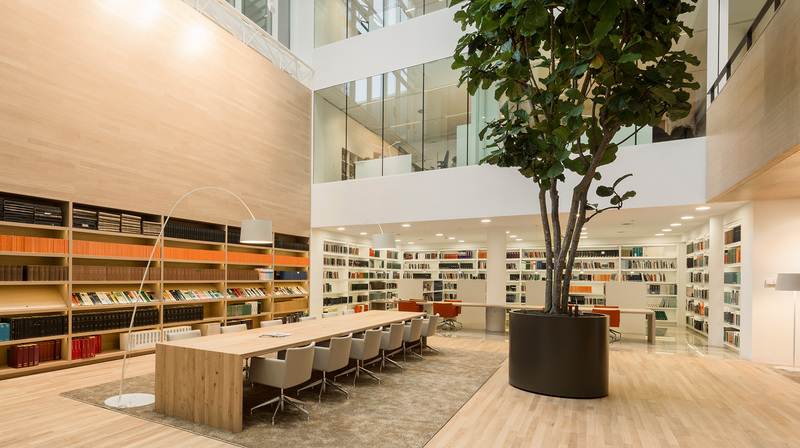 At one end of the central area is an atrium containing the legal library area with working desks and neat, ordered, wooden shelving. 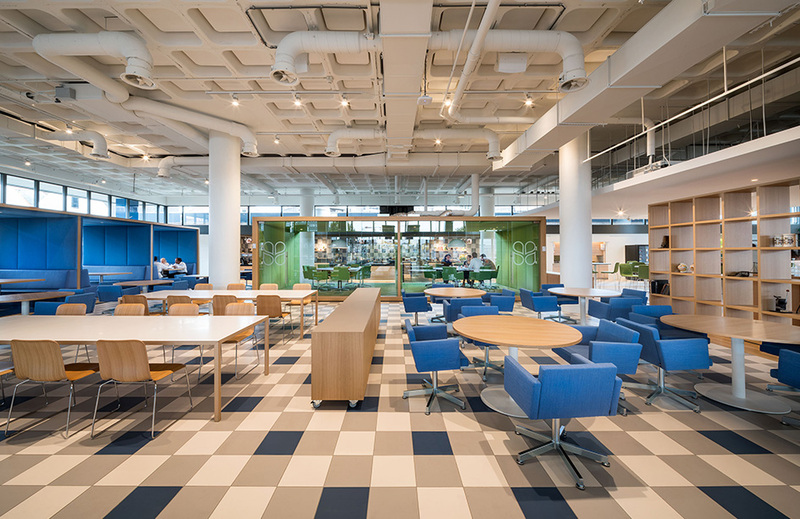 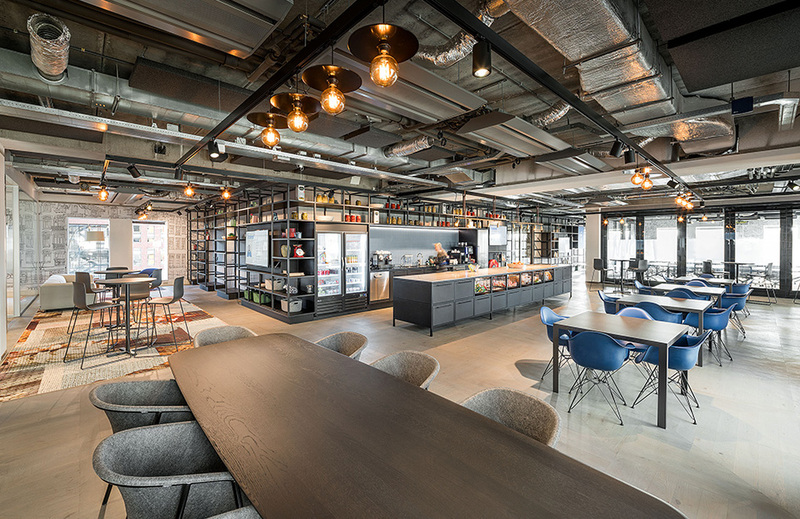 At the other end is an atrium hosting a less formal space with a coffee bar, a cafe-style bench with high stools and a large flat-screen TV. 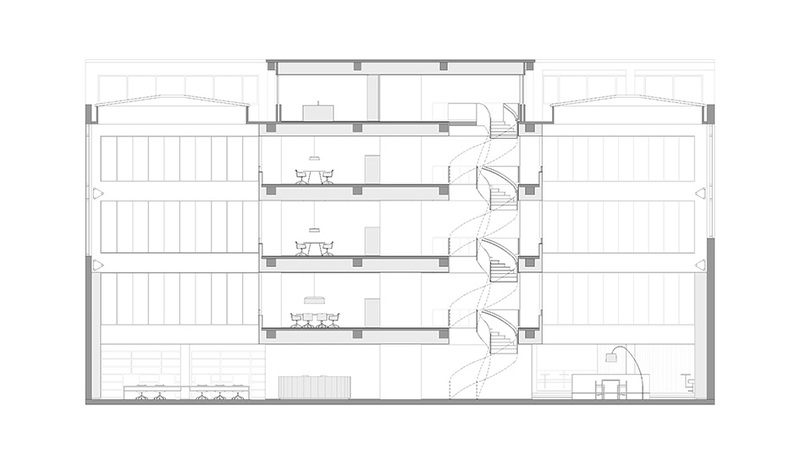 Between them is a central block containing three floors of floating, open balconies that connect the front and rear buildings and the two atrium’s. 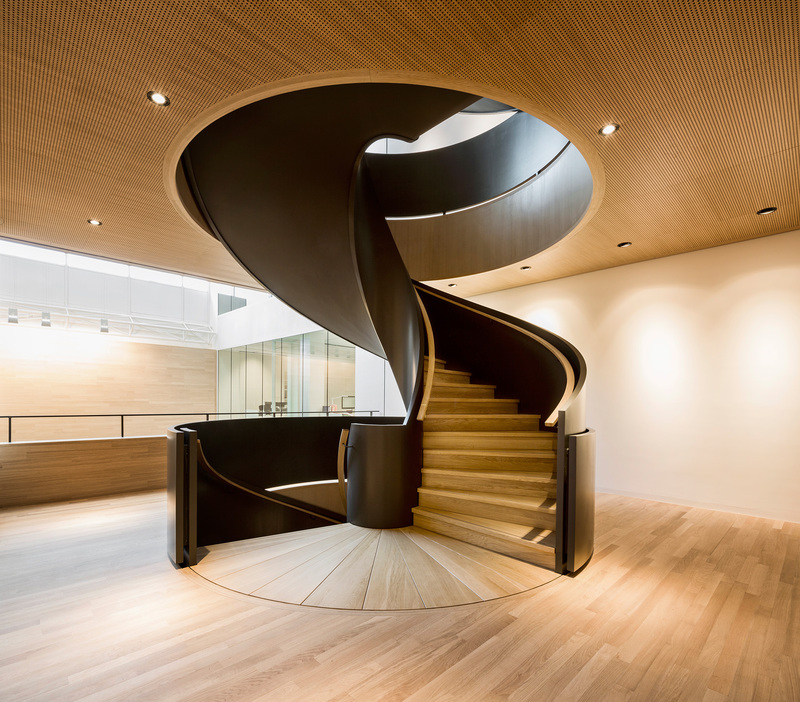 On the ground floor beneath the central block of balconies stand two eye-catching centerpieces: a beautifully calm elliptical reception desk made from light oak, and a dramatic black, cast-iron spiral staircase that snakes up all the way to the top floor. 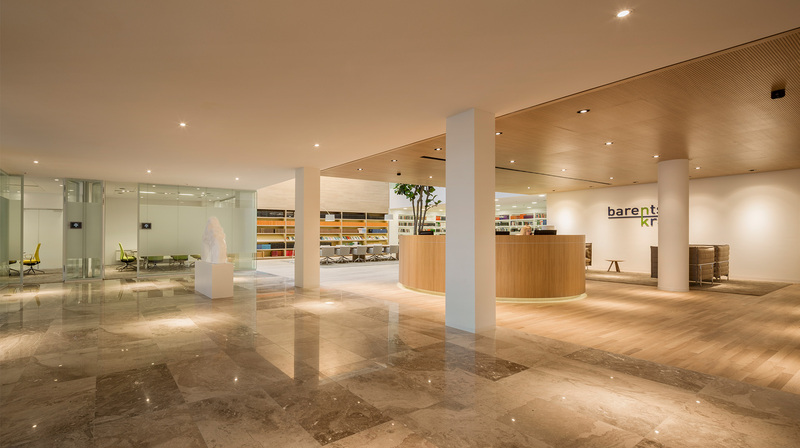 These design pieces are both practical and artistic; they immediately catch the eye and make a bold statement reflecting the professionalism of BarentsKrants, a leader in their field. 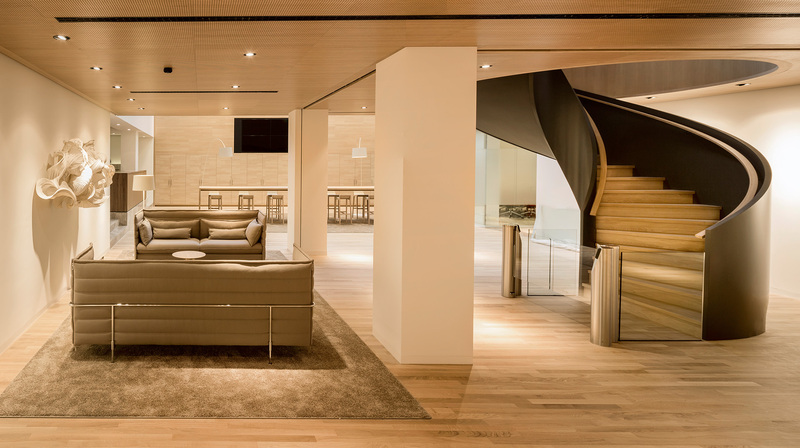 The entire central open area sits on light-oak floors, which create a warm and welcoming atmosphere. 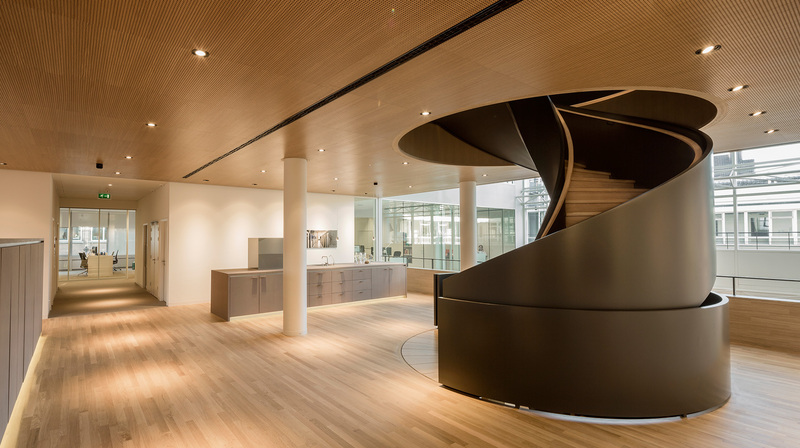 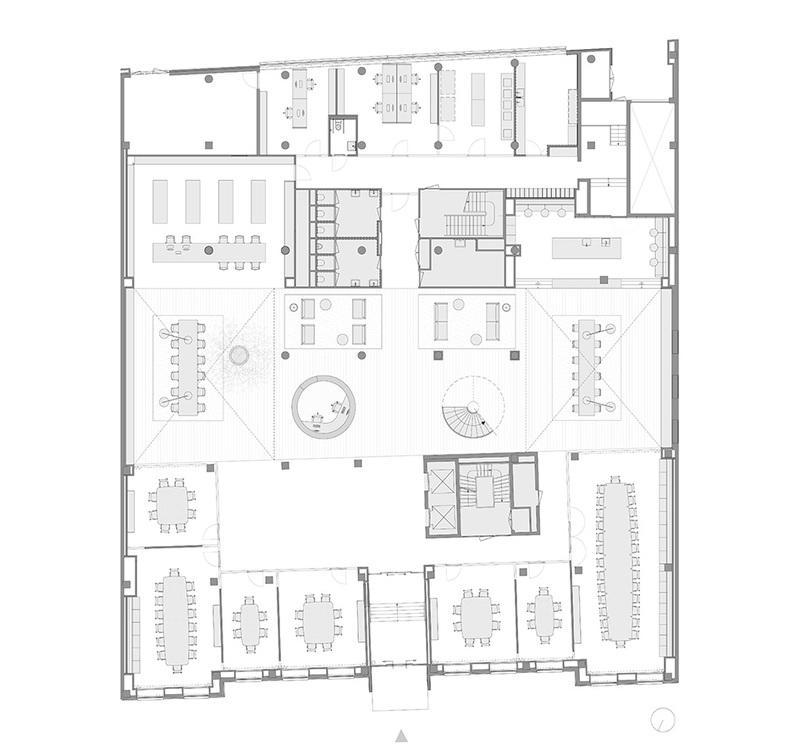 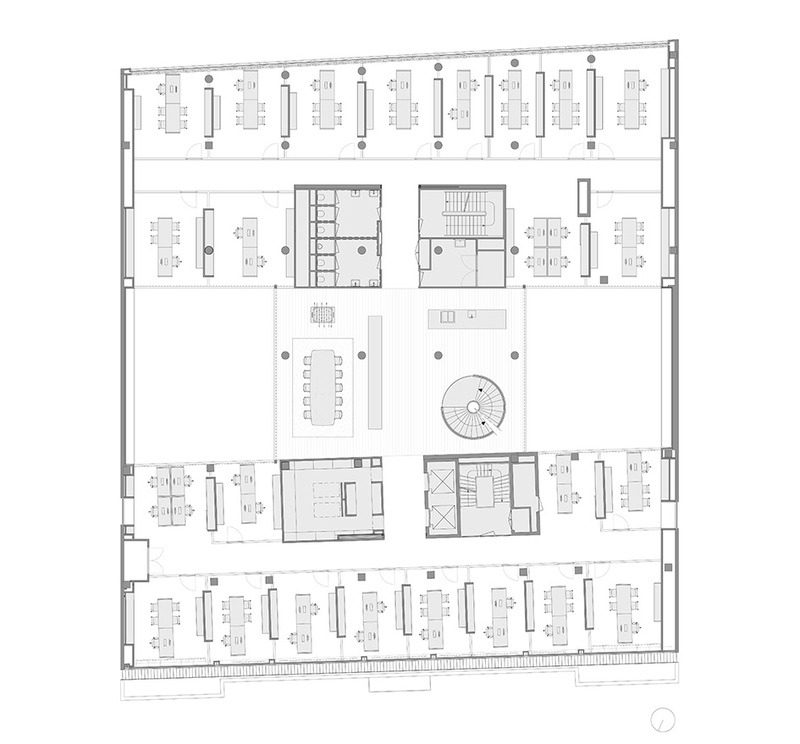 These floors are repeated on the floating balconies above, each of which has an open meeting area, a coffee bar for informal meetings and lofty views down over the two atrium’s. 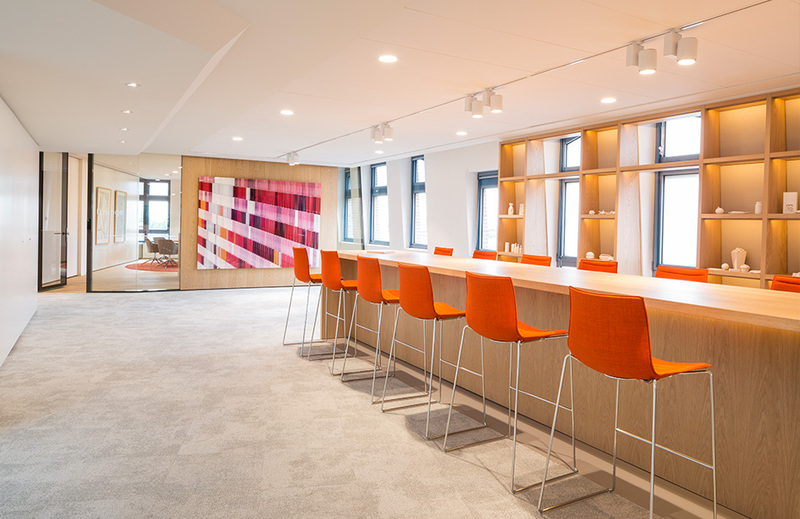 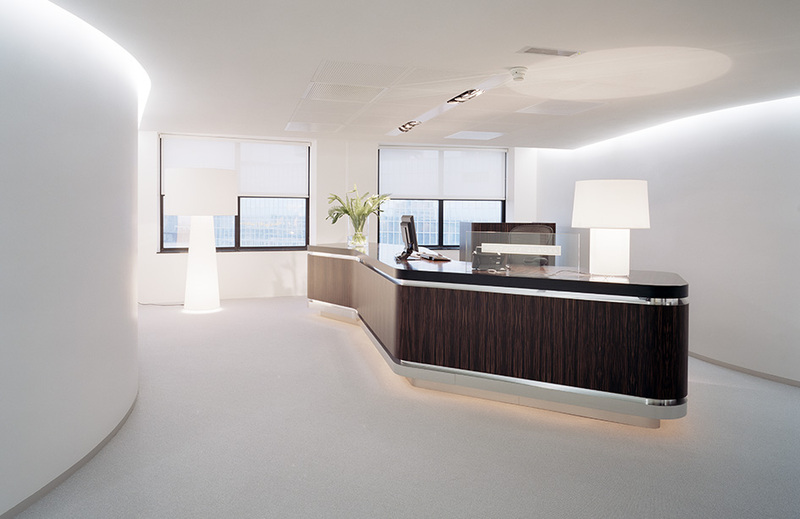 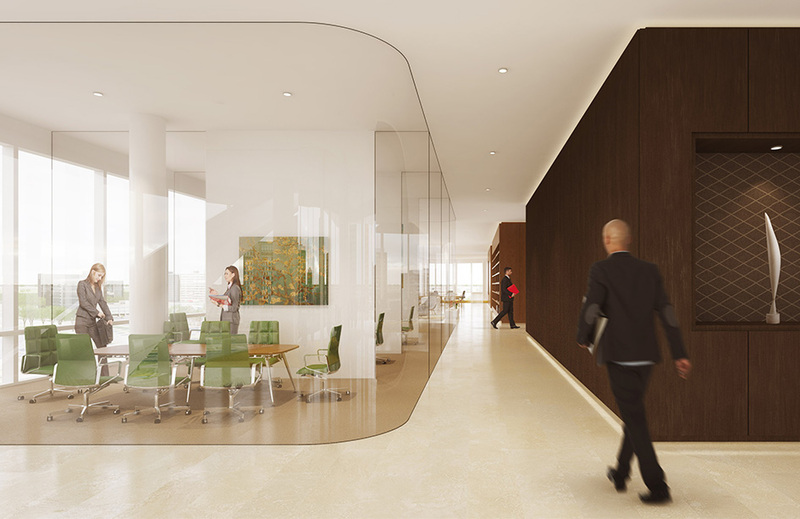 Near the spiral staircase, elegant Vitra sofas make up the discreet client reception lounge. 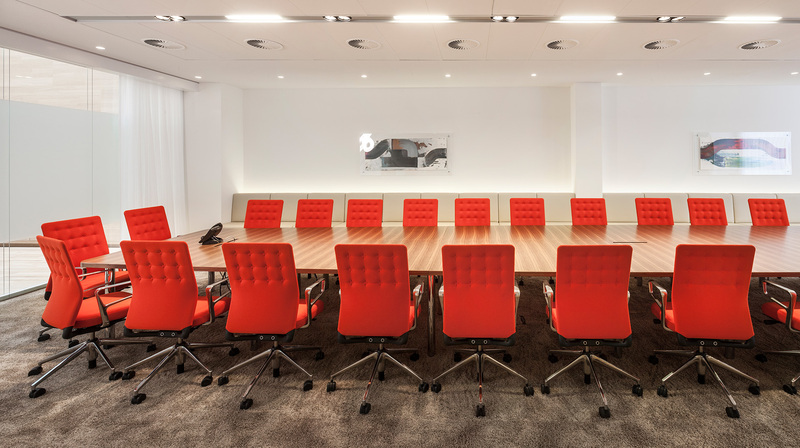 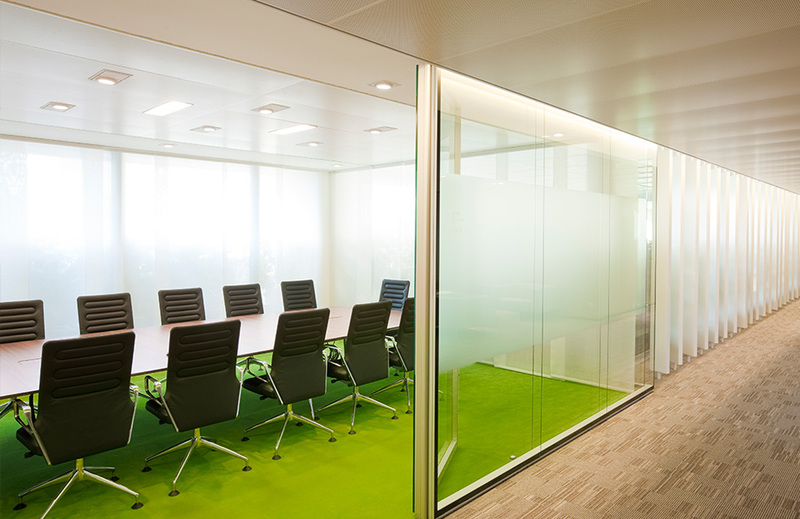 Also nearby are the ground-floor meeting rooms designed using light, natural tones and off-set by colorful conference chairs, creating a vibrant atmosphere. 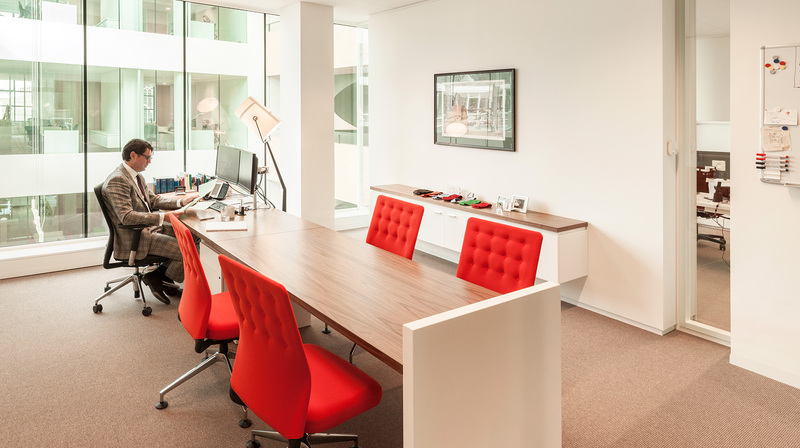 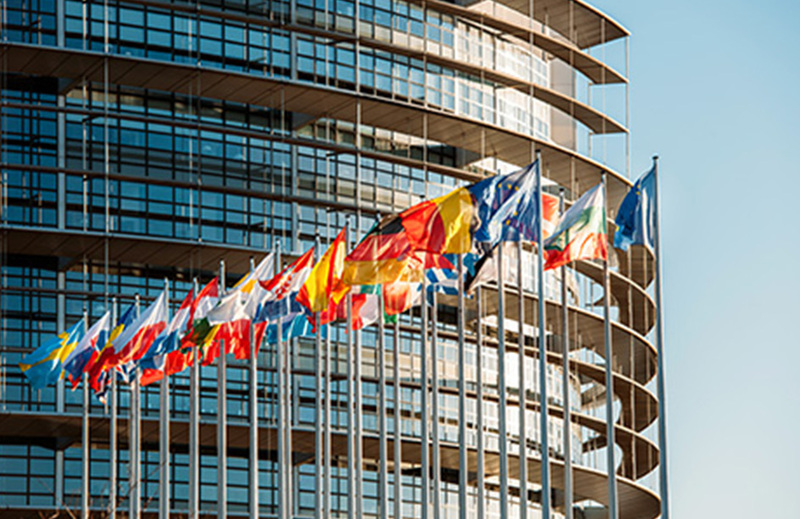 The offices for partners and employees are located in the front and the back buildings on all floors; they have large four-meter-long tables suitable for work and meetings. 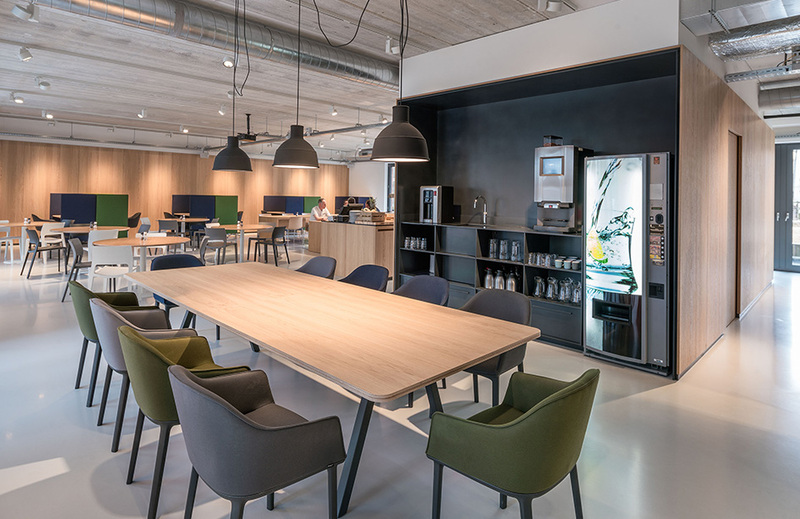 Finally, on the top floor is the firm’s restaurant with a free-flow buffet, simple wooden cafe-style tables, Eames chairs and a sunken seating area with padded banquettes where employees can take a break and gaze out over the rooftops of The Hague. 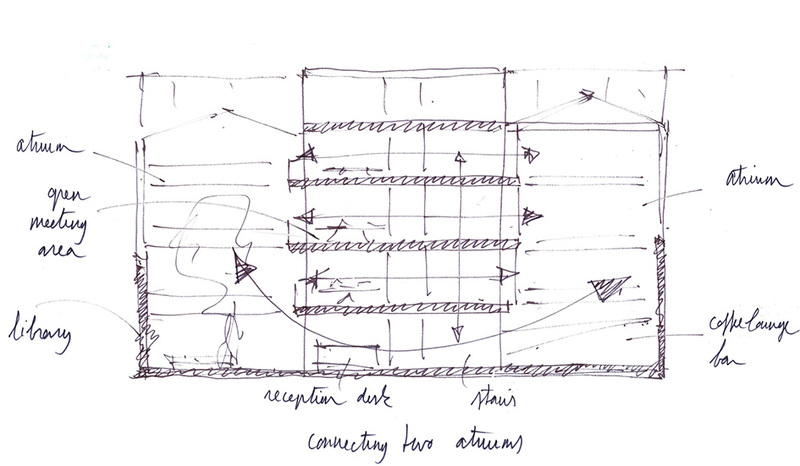 In the design process we used high quality visualizations to challenge and improve the design. 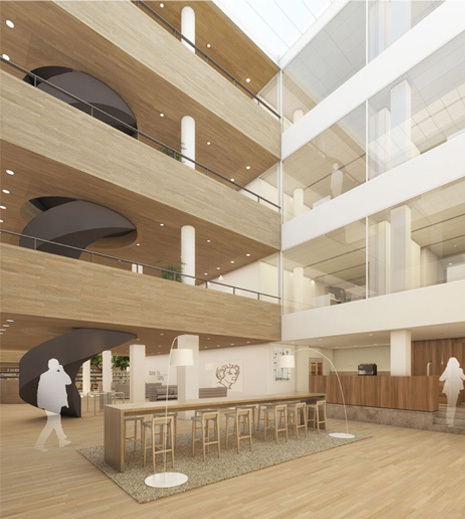 We were able to communicate the design decisions with the client, contractors and other stakeholders with the refined 3D model showing quit perfectly the final result.